Coming Soon... "Bubble Mower" and "Double Nova Rodeo"
Mix Match 3D is now available for the Android! CLICK HERE to visit the Android Market and get yours. Be on the lookout for Zombie Bowling 2.0 for the Android, coming to the Android Market this Spring. Zombie Bowling features new zombies, new bowling balls, new environments, an overhauled shooting mechanic, support for up to four players and more. Upcoming Games for the iPod touch, iPhone and iPad... and Android! Bubbles are an everyday part of life. Happy, bouncing bubbles. But now something's amiss, and there are not only bubbles but bubble baddies to deal with. That's where you come in. Bubble mowers are now more important than ever as they rid the world of more and more bubble bad guys. 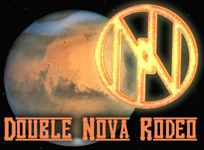 Double Nova Rodeo is the prologue to our upcoming iPad epic Double Nova Ranch, where you are the new Marshall in the territory and it's up to you to set things to right. MacWorld has been kind enough to review Zombie Bowling HD. CLICK HERE to read the entire article. CLICK HERE to visit the App Store and get yours. 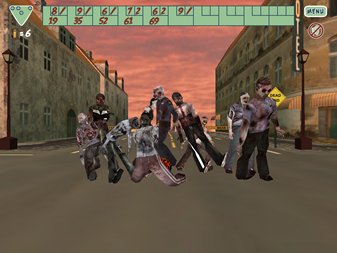 The Zombie Bowling HD min-game is up and running as a Facebook app, CLICK HERE to go to Facebook and play. Coming soon: Zombie Bowling HD online demo! CLICK HERE for a sneak peak. Also, be on the lookout for the Zombie Bowling HD Shootem' game coming soon to Facebook! CLICK HERE to pick up your copy of MM3D HD on the App Store. Be on the lookout for the iPad version of MM3D. We will be announcing two new iPad games soon, check back often! MM3D version 1.5, with OpenFeint connectivity, is available now. Hit the App Store to get your free update. MM3D version 1.5 will introduce OpenFeint connectivity, allowing the best of the Best Times to be sent to the OpenFeint leaderboard. AtlanticNet, Ltd. founder and Lead Designer Eric Johnson has been interviewed by iWorth It App Reviews regarding the development of Zombie Bowling. Read the full article HERE. New Bowling Environment: "Tropical Depression"
CLICK HERE to head to the App Store and get yours. New Bowling Environment: "Getting Medieval"
New Bowling Balls: "Tangerine" and "Violet Violence"
Our latest game, Mix Match 3D (MM3D) is now available on the App store! CLICK HERE to check it out on the App Store. Visit the MM3D Site for more info on this challenging new puzzle game. Our latest game, Mix Match 3D (MM3D) will be available on the App Store Friday December 4, 2009! Visit the MM3D Site for more info on this challenging new puzzle game. We are pleased to announce that version 2.0 of Zombie Bowling is nearing completion and should be available by the end of December, 2009. The update features integration of OpenFeint, performance enhancements for first and second generation devices, bug fixes and new content including the "Getting Medieval" bowling environment. More details will be forthcoming in the next few days. Stay tuned! Our first game, Zombie Bowling, is now available on the App Store! Learn more HERE. Visit the Zombie Bowling site on the App Store HERE. Since 1999 our primary focus has been on multimedia, e-learning and web site design/hosting. Now we are proud to announce our entry into the mobile application and casual games arenas. While we will still work with our current clients to ensure their continuing success, we are no longer accepting new multimedia/web customers. We would like to thank all our multimedia customers and wish them further growth and prosperity. for the iPad Available NOW!